The study of Epidemiology involves the analysis and research of different health related events and how they are spread within a population. For those interested in public health, this is often considered the cornerstone of the study, determining much of what is built into the varied specialized fields within public health. 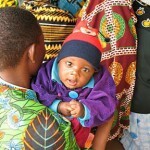 The World Health Organization maintains figures and statistics on much of what is studied through epidemiology, for example to monitor child health around the globe. As the world becomes more technologically advanced, so do the occupations and careers that operate within the global reach. This necessitates a more educated and sophisticated workforce, placing an increasingly higher importance on advanced education as a requirement for those positions. The same is true within epidemiology. For those interested in working in this area, going forward with a graduate degree can make a resume much more attractive to employers. There are many programs available for a Master of Public Health in Epidemiology degree, and with modern innovation, many of those degrees can be completed online. Some require occasional visits to a campus location, but there are some that can be earned entirely from your own location. Some examples of these top programs are as listed below. University of Southern California – (Featured & Highly Recommended!) – MPH in Biostatistics and Epidemiology – Joining the two areas of biostatistics and epidemiology will provide a broader level of knowledge involving these two, related studies. Use of statistical procedures will be shown and their ability to measure and identify health trends across populations. University of South Florida – Master of Public Health in Epidemiology – For those interested in an online education, this option provides freedom for your current location, employment, or personal commitments. Their student population consists students from all over the world. All classroom activities are available to online learners through virtual methods. The complete degree program is designed to be completed within two to two-and-a-half years. Students will have the choice between focus on infectious or chronic disease epidemiology as part of their graduate curriculum. Loyola University Chicago – Master of Public Health in Epidemiology – Prospective students interested in clinical and public health research will find this program an excellent jump start to their career. This hybrid degree program consists of both campus courses and online courses. The campus courses are held just one night a week, and in combination with the online courses, provide for a very flexible alternative to a traditional campus graduate degree program. Pivotal to the program is the application of SAS and STATA software for analysis of all epidemiology and biostatistical information. Johns Hopkins University – Master of Public Health in Epidemiological & Biostatistical Methods for Public Health & Clinical Research – The curriculum in this specialized program is geared towards those with quantitative backgrounds, whose primary interest is in epidemiologic study design and statistical data analysis. Those with previous experience in this area is the best fit, for their own personal interests and research questions can inspire their course of study towards their own personal professional goals. Within this graduate degree program, students select between the Epidemiology track or the Biostatistics track. As part of an advanced graduate degree in Epidemiology, there will be a lot of specific expertise gained in their particular field of study. 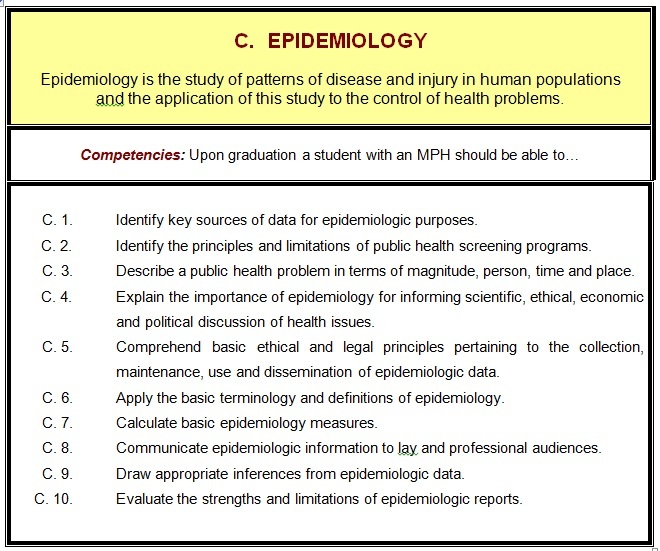 Since the Epidemiology study is a specialization under the Master of Public Health degree, there is a whole core set of courses that provide a foundation of knowledge for students on the study of public health. Beyond this core of courses, the specialized courses in the field of epidemiology will begin. Each school will offer different studies within epidemiology for each prospective student to focus on. The various fields can include different types of diseases, different types of transmissions, and different ways of studying the diseases. For example, if a student is interested in focusing their educational efforts on epidemiology of cancer, they would be able to choose their elective courses around that specialty, as long as they choose a school that offers that specialty that matches their particular career aspirations. By completing the above described studies, graduates of MPH programs can be assured that the information they need to operate within their field of study will be fulfilled. Mary Myers Scholars Program in Epidemiology – As a student at Johns Hopkins University, this scholarship is awarded to those interested in doctoral education in epidemiology. Scholarships are awarded to one or two students each year. Katherine Ketre Scholar Fund – This University of Pittsburgh scholarship is provided to those approved to work a Graduate Student Researcher position while completing their studies. Charlotte Silverman Award – This scholarship intends to recognize and fund those who bring significant service towards the various outreach projects involving the Department of Epidemiology. Miriam Bailey Fund – For those underserved populations interested in graduate studies in Epidemiology, this fund was established in 2000. It is designed to provide support for incoming students to the graduate program. Mitch Greenlick Public Health Scholarships – Students interested in careers working with underserved minority communities can apply for this scholarship. 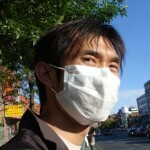 It is for students at the Oregon Health & Science University. Indiana University Assistantship Positions – These are paid, one-year positions requiring part-time work in support positions of the School of Public Health. Can be associate instructor, graduate assistant, or research assistant. CDC Applied Epidemiology Fellowship – This fellowship is offered jointly between the Center for Disease Control and the Council of State and Territorial Epidemiologists trains recent graduates in the field of applied epidemiology. The two year program aims to supply a trained workforce to the industry of applied epidemiology. APTR Preventive Medicine and Public Health Fellowship – Offered jointly between the Association of Prevention Teaching and Research and the Center for Disease Control, works with those interested in public health practice and policy. This consists of a one year term with exposure to leading experts in the field to aid in training. 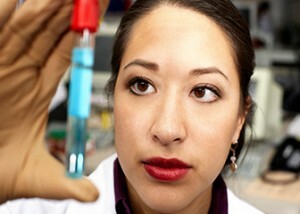 William Randolph Hearst Scholarship – This scholarship is given to one student per year, and provides support to student interested in public health careers and is one where financial need is considered, and Georgian residents are given priority. Public Health Traineeship Award – The U.S. Public Health Service grants several of these awards per year. It is designed to reward students going into fields of which our country has critical shortages of. American Journal of Epidemiology – This journal focuses on the publication of current findings and thinking in epidemiology. It addresses both epidemiologists as well as others who use their resulting data. The Epidemiology Monitor – This international journal provides an location for latest developments in epidemiology. This journal also has an accompanying monthly newsletter, that has been maintained for over 32 years. This covers people, events, research and key events in the study of the field of epidemiology. Journal of Epidemiology & Community Health – Focusing primarily on epidemiology in terms of applied, methodological, and theoretical issues related to health worldwide. They seek to improve the information availability in order to continue improvements in global response to disease transmission. Annals of Epidemiology – Chronic and acute conditions and their methods of distribution are the main interest of those in this journal. These are of primary importance to all areas of health care delivery and service. Peers review the works submitted, allowing each to express their own opinions and responses. Journal of Clinical Epidemiology – Global improvements in the quality of health care research is the goal of this journal. They use innovative clinical epidemiology methods in conducting of their different data and results. This includes translation of research results into ways to positively impact clinical practice. Introduction to Epidemiology – This online training provides an overview of epidemiology, key terms, and examines the role of epidemiologists in public health practice. It includes some case studies and a discussion of how epidemiological studies are related to public health issues. Epidemiology of Infectious Disease – Basic fundamental information about infectious disease are covered, as well as detailed study and analysis of different outbreaks of these diseases throughout history. A variety of tools and methods are used in order to provide the broadest understanding of the study and its applications. Epidemiology and Biostatistics – Designed for future medical professionals, this course provides necessary framework by which students can learn to read and understand the leading medical journals in their field of study. This enables them to keep abreast of modern developments and thinking and how it shapes the way their type of medicine is practiced. Psychiatric Epidemiology – Psychiatric disorders are studied as well as the techniques used in order to research these conditions in the medical community. The examination will look into major mental disorders that come up at each stage of life: childhood, adulthood, and late adult life. Interaction Between Infections and Diabetes – This lecture is based on the relationship between uncontrolled diabetes and the growth of other infectious diseases. By understanding this better, students will be able to see how mortality can be affected by the controlling of these diseases, such as tuberculosis, where they are common. For the field of epidemiology, the highly computational nature of much of the diagnostic research indicates the benefit of an advanced degree for gainful employment in these positions. The above options give different choices to students in the way that the education can be delivered and completed. SEE ALSO: Online Public Health Courses + Free & Certificate Options! Whether a particular student is able to relocate to a college with this program, or just complete it online from where they are currently residing, the barriers to further education are becoming smaller. The above list represents some of the unique programs that provide their own angle to the broad field of epidemiology.